You can start a career in the medical field in two years or less by studying Emergency Medical Services at Dallas Community Colleges. Choose from several degree or certificate options. Students with EMT or Paramedic credentials often work in places such as hospitals, 911 services, police and fire departments. If you’re interested in becoming an EMT or a Paramedic, keep reading. You may be asking yourself, what is the difference between an EMT and a Paramedic? Good question! They both serve on the front lines when emergencies happen. The biggest difference is education and training. If you plan on earning your basic EMT training, there is 150-200 hours of training, while paramedics receive at least 1,000 hours of training. You’ve come to the right place! 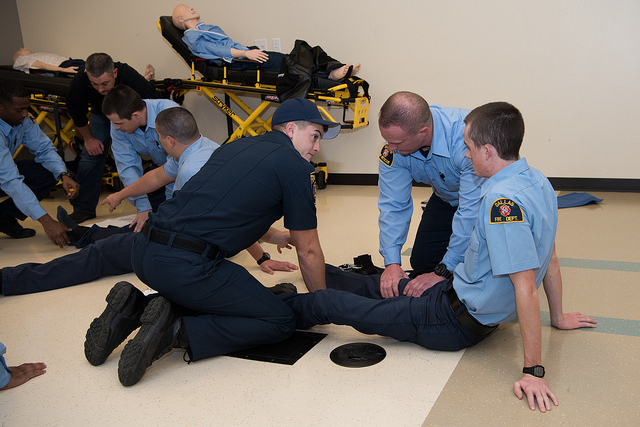 You can study to become an EMT with Dallas Community Colleges! Brookhaven, El Centro and Richland colleges have EMT certification classes and Paramedic training. Paramedicine Associate of Applied Science Degree. After prerequisites are completed, this degree can be completed in two years if you’re a full-time student. Emergency Medical Technician Basic Certificate. This certificate can be competed in one semester. Paramedicine Level II Certificate. After prerequisites are met, this certificate can be completed in three semesters. Credential for Critical Care Professionals Enhanced Skills Certificate. This certificate can be completed in one semester. Noncredit EMS Certifications: Brookhaven College’s Continuing Education Division offers several noncredit emergency medical skills certifications, as well as the National Registry of Emergency Medical Technicians (NREMT) exam, ACLS, PALS, PEPP, AMLS, PHTLS and BCLS (CPR). Paramedic Certificate. This certification is for students who are already certified as Emergency Medical Technicians (EMT). El Centro College also offers an EMT program for continuing education credits. You will receive credit for the EMT course, once you complete the Paramedic course. Richland College offers a Continuing Education program, registered with the Texas Department of State Health Services (DSHS). EMT- Emergency Medical Technician certificate. This is an entry-level certification that trains you to provide basic life support and emergency health care. What Skills Do I Need to Become an EMT or Paramedic? If you have the following skills below, you’re ahead of the game. If not, no worries! You can learn the skills needed to catch up. Be proficient in all basic skills, such as starting IVs, drug dosages and how to load and unload a patient in an ambulance. Being already certified as a firefighter, EMT or paramedic makes you more marketable for fire departments. If you are not certified, make sure you maintain a good academic record, stay physically fit and have strong references. What Does a Day Look Like in the Life of an EMT or Paramedic? Working indoors and outdoors, in all types of weather. Exposure to infectious diseases such as HIV and Hepatitis-B. Making quick decisions in life-and-death situations. Working well under pressure and be able to react to patients who are stressed and in pain. First, make an appointment with your advisor, so that you can plan your schedule.The road to becoming an EMT or paramedic isn’t as long as you think. You should know that EMT training comes first and then you can apply to different jobs. Graduates of Brookhaven’s associate degree in Paramedicine are eligible to take the National Registry of EMTs exam and apply for a Paramedic license with the Texas Department of State Health Services. Graduates of Brookhaven’s or El Centro’s Paramedic certificates are eligible to take the National Registry of EMTs examination. Previous Post Get Out the Vote! Election Day is Tuesday, Nov. 6! Very nice you said as they both serve on the front lines when emergencies happen. The biggest difference is education and training. If you plan on earning your basic EMT training, there is 150-200 hours of training, while paramedics receive at least 1,000 hours of training. Thank you! Hope you enjoyed reading the blog.